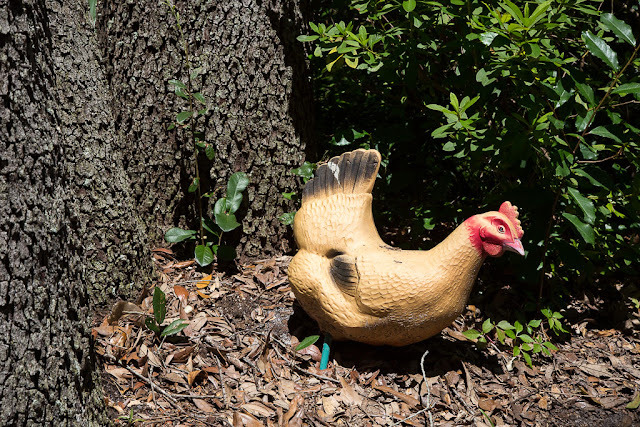 This plastic chicken lives in my brother's front yard, where it stays tucked behind a hedge plant, invisible from the street. We know it's a ridiculous and tacky lawn ornament, but there's a story behind it. My brother, like me and many other people, went through a period as a teenager when he'd occasionally steal small and inexpensive or odd items as a prank. The chicken was one of his heists. It came from someone's yard in a trailer park across from the Wal-Mart in our hometown. It lived in my mother's garage for years, and after JM went out on his own, the chicken went with him. We laughed about it last night, agreeing that the chicken has lived a much longer life (30 years at this point!) than it probably would have if it had stayed in front of that trailer. JM is a saver. While I tend to pass things along or throw them out, keeping my load of possessions relatively light, JM holds onto them. Not to say that he is a pack rat or a hoarder -- he's very organized and everything is meticulously preserved and in its proper place. Coming over to his house is always fun for me because it's like browsing our childhoods once again -- he's got paperback books we both read, pictures that used to hang in his bedroom, and all kinds of Volkswagen paraphernalia from my dad's garage. Yesterday we went to my Mom's in the morning and spent some time with her. We ran a few errands and took her to lunch. (I had an avocado veggie wrap, which sounds healthy, but given how big it was and how many fries came with it and how much dressing it contained, I'm pretty sure health was an illusion.) We got her DVD player functioning -- it's been out of commission since the last visit from her cable TV guy, who apparently unplugged everything except the cable. Now she can watch those home movies I had digitized, if she's at all motivated. 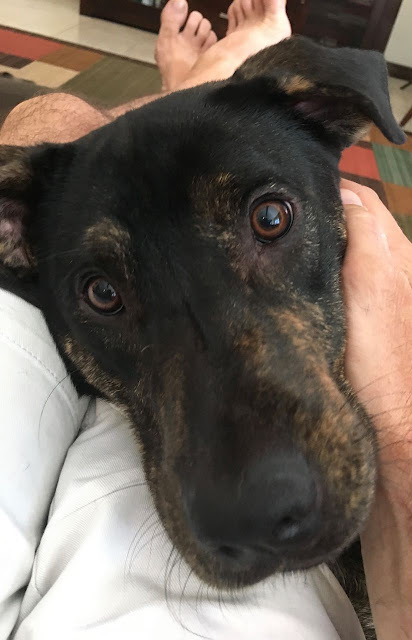 Look at those beady dog eyes! JM is an odd name for a brother. Is that name common in Florida? Perhaps it's an abbreviation - Jean-Michel, Justin Maurice, Jumbo Monkeynuts...? Or is it simply that he wishes to keep his name secret because of plastic chicken thievery. Don't want the cops knocking on your door. Queens has a sweet face! I like the story about the Trailer Park Chicken. There's a stop sign at my parents' house to this day that my high school boyfriend stole for me and all of my friends signed in permanent marker...I have no idea how to dispose of such a thing! I think when you steal something from the front lawn of a trailer park, your punishment should be that you are doomed to keep it and display it forever. lol Fun story. That. Face. It deserves many smooches. Well, I like the trailer park chicken. She's a nice hen although she looks a bit startled. Probably still wondering where her tailer is. Your avocado wrap reminds me of the time I had breakfast with someone who shall remain anonymous who ordered a huge, regular breakfast with eggs and grits and bacon and biscuits, etc. AND a "healthy" yogurt with granola. Which in and of itself probably had enough calories in it for a day. Queens is adorable. She looks like she would love lots of hugs and pets and running around having fun. That chicken is pretty cute too. I like that your brother holds on to things that evoke long-ago memories. Queens looks like a sweetheart! Loved the chicken story! We have a chicken just like that! or did. I haven't seen it lately so it might have been tossed out after the flood or still in one of the boxes I haven't unpacked. our son was in the habit of bringing home stuff he found outside, sort of like you, and one day ha came home with the plastic chicken. it stayed with us when he moved out. it's been of river trips, had a mold made of it's head and cast in glass. it suffered a serious crack though during a game of water volleyball, it being the volleyball. now I'm going to have to go see if I can find it. Sounds like your family visit is off to a lovely and productive start. Lounging around with family is perhaps my favorite pastime. Queens is adorable - and does look like she might get up to something given half a chance. It sounds to me like both you & your brother are family archivists. Cool! Queens looks like a charmer! Tell your Mom I said hi. Glad she's doing well. Queens does look needy but she doesn't have the face beauty of Olga. That chicken is a vastly superior heist compared to the dinky wine glass I liberated at university and still feel guilty about . . .
Love the photo of Queens and the story of her and her sister's names! Somebody has to be the keeper of the family treasures! Queens is a lovely girl, sorry her sister had to go elsewhere, no wonder Queens has that Wheres-my-sister- look. It is so nice that you still have family to spend time with. Avocado , no matter, is GOOD for you!